34.5mm x 43.8mm 18K pink gold case set with 82 brilliant-cut diamonds totaling 1.96K, 9.3mm thick, sapphire back, fluted 18K pink gold crown set with a faceted brilliant-cut diamond of 0.15K, 18K pink gold bezel set with 82 brilliant-cut diamonds totaling 1.96K, sapphire crystal, pink gold dial, caliber 9619 manual-winding movement with gilded-steel sword-shaped hands, approximately 3 days of power reserve, brown alligator skin strap, double adjustable folding buckle set with 46 brilliant-cut diamonds totaling 0.45K. Water resistant to 3 bar. 34.5mm x 43.8mm 18K pink gold case case, 9.3mm thick, sapphire back, faceted crown set with a faceted blue sapphire, 18K pink gold case bezel, sapphire crystal, skeleton dial, caliber 9619 MC manual-winding movement with gilded steel sword-shaped hands, approximately 3 days of power reserve, brown alligator skin strap, double adjustable folding buckle. Water resistant to 3 bar. 34.3mm x 44.0 mm by 9.5mm thick 18K pink gold case, sapphire crystal back, octagonal crown set with a sapphire, sapphire crystal, silvered flinqué dial with blued steel sword-shaped hands, caliber 1904-PS MC automatic winding movement with calendar aperture at 3 o’clock and small second at 6 o’clock, semi-matte dark brown alligator strap, double adjustable deployant buckle. Water resistant to 30 meters. 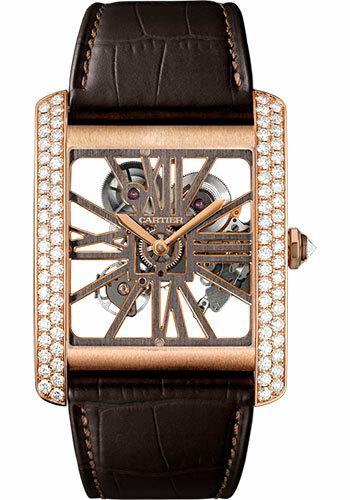 34.3mm x 44.0 mm by 9.5mm thick 18K pink gold case, sapphire crystal back, octagonal crown set with a sapphire, sapphire crystal, flinqué chocolate-colored dial with pink gold sword-shaped hands, caliber 1904-PS MC automatic winding movement with calendar aperture at 3 o’clock and small second at 6 o’clock, semi-matte dark brown alligator strap, double adjustable deployant buckle. Water resistant to 30 meters. 34.3mm x 44mm 18K pink gold case, 11.7mm thick, sapphire back, faceted crown set with a faceted sapphire, 18K pink gold bezel, sapphire crystal, silver dial set with calendar aperture at 6 o'clock, caliber 1904-CH MC automatic movement with sword-shaped hands in blued steel, dark brown alligator skin strap, folding buckle. Water resistant to 3 bar. 34.3mm x 44.0 mm 18K pink gold case, 9.5mm thick, sapphire back, crown set with a faceted sapphire, sapphire crystal, gray flinqué dial with golden finish steel sword-shaped hands, caliber 1904-PS MC self-winding movement with calendar aperture at 3 o'clock and small seconds counter at 6 o'clock, approximately 48 hours of power reserve, dark gray alligator skin strap, double adjustable folding 18K pink gold buckle. Water resistant to 30 meters.